Parents can complete an Express Check-In from an iPhone/iPad and Android Phones/Tablets. They can Check-In at any organization where they’ve previously completed a traditional Check-in that has Express Check-in enabled. 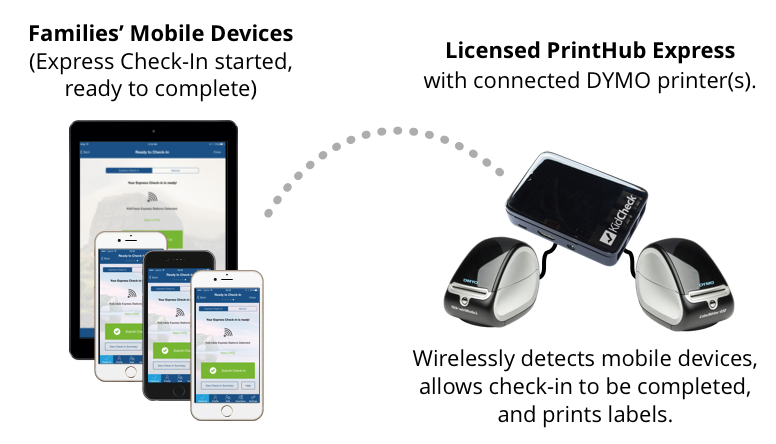 Express Check-Ins allow parents to set up a Check-In prior to arrival then print name badges automatically via a KidCheck PrintHub upon arrival on-site or from a traditional Check-In Station. Watch our Express Check-In Video for Parents or read below for more information. Login to the KidCheck App on your iPhone/iPad or Android Phones/Tablets. Follow the on-screen prompts to select your organization, children to check-in, options, etc. Follow the on screen prompts to select your children for check-in, locations, and other options. Upon arrival at the organization, if they have an enabled PrintHub, the KidCheck app will detect when you’re within range to print. You can open the KidCheck app and complete your check-in to print name badges by selecting the green Submit Check-In button. Alternatively, you can input your phone number at a traditional Check-in Station or scan your QR to complete Check-In at a Check-In Station to finalize your Check-In. Express Check-In allows parents to initiate check-in before arriving at the organization. They can then complete their check-in quickly once on site. For more information on Express Check-in, you can also check out our Express Check-in benefits.